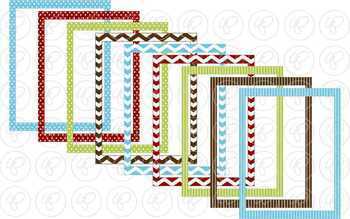 Nine (9) page frames 8 1/2 x 11 size in both jpg (with white center) and transparent png (with transparent center) format PLUS 18 labels (4x6) in png format (frame in center of label is WHITE, not transparent). All elements are high resolution 300 dpi format. 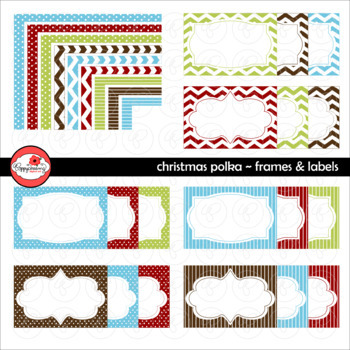 Coordinate perfectly with sets in my Christmas Polka Series! 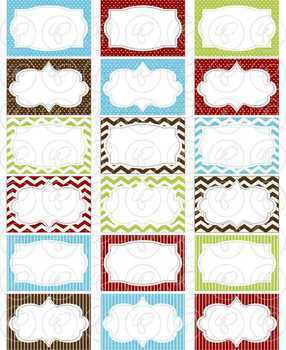 Great for task cards, name badges, desk labels, cubby tags, photo frames, and so much more!!! Personal and limited commercial use. Copywrite remains with Poppydreamz Digital Art. If you are interested in exclusive digital art, please contact me. This is intended for use by one teacher in one classroom. It is not to be redistributed to an entire school or district. It may not be redistributed or sold online or other. You MAY share finished projects that you create in online galleries, blogs and websites. PLUS, if you send me a link to what you create, I will cross-promote your shop on my social media outlets! You MAY NOT claim as your own work, altered or unaltered. Copywrite of images remains with Poppydreamz Digital Art. THANK YOU! for shopping and please contact me if you have any questions!! !